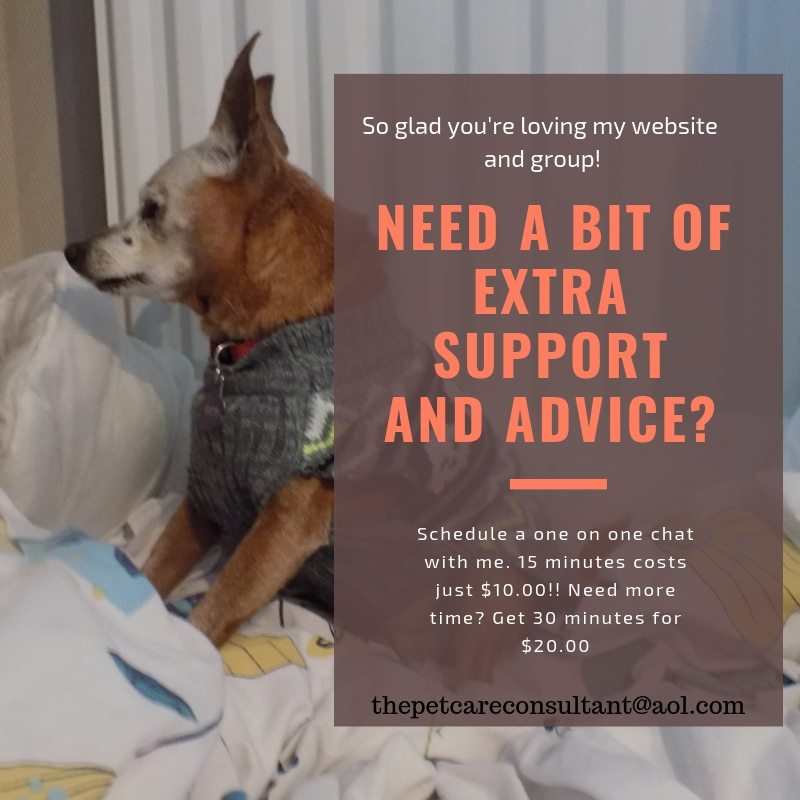 It is so heartbreaking to witness separation anxiety in senior dogs, I want to take a look at what it is and how we can help. Separation anxiety can be experienced by dogs of all ages, yet it is one of the most common behaviours in senior dogs. Not only can it be harder for older dogs to handle changes in routine, but losing hearing or sight will likely make them more anxious in general. Add an absent owner to the mix and you have a recipe for some serious anxiety. Separation anxiety is, literally, anxiety a dog feels when separated from his guardian. There are various degress of anxiety ranging from mild discomfort to ripping the house apart. found wandering and very skinny. We don’t know anything about her “officially” but because of her extremely skittish nature, we assume she was gun shy, of no use as a hunting dog so was tossed out (too common in Spain I’m afraid but that’s another story). Her anxiety was obviously caused by being alone on the streets, abused, taken into a home then given back to the rescuer, then put into kennels for 7 months until my husband and I took her a few weeks ago. She is attached to my husband 24/7 and shrieks when he goes out. She tears around the house looking for him, and looks out the window as he walks away. When he’s home she sits with him constantly. If she’s left alone she’ll chew whatever she finds, although I have discovered if she’s left in the hallway with a couple of toys she’s better. We see the progress she’s made in the short time she’s been with us – love, a routine, tons of exercise, a good meal twice a day. She’s off to her new home in a few days, and I have told her new dad what’s what, but to see such an incredibly sweet dog going through hell is heartbreaking. She’ll settle into her new forever home, and with guidance on how to help her she’ll start feeling better. I don’t know if she’ll ever be totally anxiety free, but I’ll keep in touch, see how she’s getting on and offer advice when I can. When the parent returns, the greeting is frantic, as though they’ve been apart for a very long time. It goes without saying this is very stressful for the dog, the pet parents (if they know about it), and the neighbours forced to listen to this all day long. The good news is, separation anxiety can be worked through. But is it really separation anxiety? As dogs age, many find it harder to cope, and certain medical conditions like Canine Cognitive Disorder (or doggie dementia) can up the anxiety level. Some dogs may even keep their humans awake at night, because they view sleep as separation. Vision or hearing impairment can also contribute to the development of a generalised anxiety, particularly if left alone. Previously housebroken dogs may “forget” their training, or a medical issue that causes frequent urination may lead to accidents in the house. Some pet parents resort to using a crate to confine their dog when they’re out, not understanding that crate training is a process, not something you just throw your dog into. The “being locked up” part can cause serious anxiety, not the separation from you. If you are noticing changes in his toileting habits or general behaviour, please see your vet, as there are several medical conditions that can explain these changes. Another point to consider – if you have recently welcomed a senior dog into your home, it is quite possible his anxiety is simply him getting used to his new life. 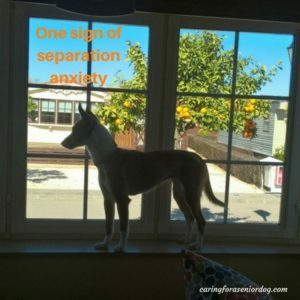 If it is separation anxiety, what causes it? Conclusive evidence as to why some dogs develop separation anxiety, really doesn’t exist. 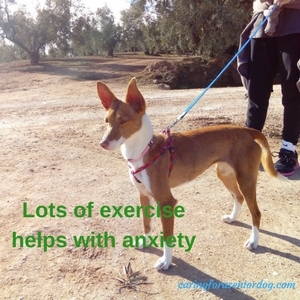 In addition to conditions like Canine Cognitive Disorder mentioned earlier, things like: moving house, being bounced around from shelter to shelter or home to home, neglect, loss of important people in his life, an emotionally traumatic experience, lost in unfamiliar surroundings and a change in schedule, are all known causes. your dog’s age and physical condition. Tiring him out before you leave the house, may make him more relaxed about spending time alone. Training, games, tracking, and agility are just some of the ways to challenge your dog mentally, in addition to physically. Again, the activity you choose will depend on your dog’s physical capabilities, but perhaps some of the more challenging ones could be scaled back to accommodate. Most of us have a routine we follow each time we’re ready to leave the house. It doesn’t take long for your dog to learn it, and realise that once you’re finished, he’s going to be left alone. That can send him into full panic mode. His anxiety may even start building as you begin getting ready, because he knows what’s coming. Changing your routine may help. For example, he knows that when you put your coat on, you leave the house. Why not put your coat on randomly during the day, then open the mail. Grab your keys, and put them in a different place. After a few weeks with no discernible pattern, he may be less anxious when you walk out the door. You know the tilt of the head a dog gives you when you go out? That look that says “I’m way too cute to leave me?” How many times do you go back in when you see the head tilt? We smother them with affection and attention before we leave, and again when we return. Whether it’s guilt, or because we genuinely hate to be apart from them, it’s bad all around. All this drama simply adds to his anxiety. The better way is to not pay attention to your dog a few minutes before you leave, and for a few minutes after you get back. The new message, and the right message you’re now sending him, is that your absence is temporary, and nothing to be concerned about. This exercise involves a gradual buildup of time spent out of the house. For this to work you need time, patience, and commitment. To begin, step out the front door for just a couple of minutes, then come right back in. Remember, don’t make a big deal out of it. If your dog suffers from severe anxiety, you may only be able to step outside for a second, literally, before having to coming back in. If that’s the case, than a second it will have to be. Once you’re back in the house go about your business, giving your dog a few minutes to relax, then do it again, slightly increasing the time outside. That might mean only 2 seconds, than 3 the next. That’s fine, just keep adding each time. You can also vary the length of time you stay out. For instance – say you’ve worked up to 7 minutes, the next time leave for 4 minutes, then 8, than 5. Within a few weeks, your dog’s anxiety should be significantly reduced. A very important note: if at any time your dog barks or seems agitated when you’re out, you have moved too quickly. Go back to the time he was still comfortable, and start from that point. The above suggestions, while helpful, do take time to work, and in the meantime, your dog will still be suffering from anxiety. Here are some suggestions to help give him some relief. Consider asking your vet’s opinion about prescribing a low dose anti anxiety tablet for short term use. I’m not a fan of excess medication, but in this case instant relief may be the kindest thing you can do. Less stress might also mean greater ability to focus on the training. There are many pheromone products available on the market that mimic natural dog pheromones, and may relieve stress. They come in various formats such as plug in diffusers (like the air freshener you plug into sockets in your home), collars and sprays. Rescue Remedy is made up of 5 Bach flower remedies, to help your pet deal with stress. It’s easy to use, just add a couple of drops to drinking water, or a drop to a treat or meal, or rubbed on paws or ears. Many vets I’ve dealt with have recommended this product and I know lots of people have had success with it as well. I personally haven’t, but that was just my experience. A garment that applies gentle but constant pressure around the torso, to help calm nerves. Why not hire a dog walker or ask a neighbour, family member or friend to help? It will give your dog company and relief while you’re out, a bit of help coping until he’s feeling better. If your dog is anxious because of a condition like doggie dementia, having someone be there with him can be especially important. A doggy daycare facility is another option to consider, giving him the chance to interact and have fun with other dogs. Put one of your t-shirts or sweaters in his bed, as your scent may comfort him. Leave a radio on low, playing soothing music or invest in a selection of music specifically created to calm pets. I played some snippets of this CD for my senior dog Red, and she fell asleep instantly. I think it relaxed me as well!! Help your dog learn independence by paying him attention when you want, not when he wants. He will soon learn he gets more attention by not constantly seeking it out. Many humans find massage relaxing, and stress reducing, why not dogs? While these tips usually work, they aren’t guaranteed to work with every dog. Your dog may respond to one, or you may need to consider trying a combination. If you’ve tried everything and nothing seems to work, a behaviourist experienced in dealing with this issue may be the next step you need to take. 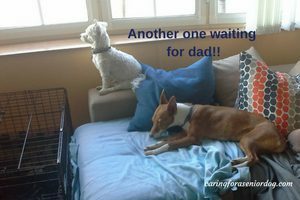 There is so much help available to treat separation anxiety in older dogs, please don’t let him or her suffer another moment. Incredibly informative post – you hit the nail on the head on all points. Sharing! Hi Lindsay, thanks very much, and thank you for sharing. I think separation anxiety is a new concept for many, and most people, in my experience, seem to think their dogs are fine alone all day, and they just sleep. 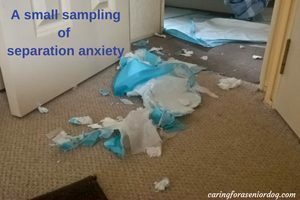 I sincerely hope this post will help make more people aware of the anxiety their dogs suffer, and to know there are lots of ways to help. LOL, I never would have been able to think of this myself. I guess the point is that all living beings have feelings and emotions, and actually, since a dog doesn’t have intellect, it’s not like he can reason to himself, and reduce his anxiety by logical thinking. I guess he’s really like a baby all his life, and needs a lot of TLC. Hi Ben, I appreciate your comments on this post, but I’m not sure I would agree with you about dogs not having intellect or being like babies all their lives. This is more about people realising that dogs are social creatures, and it is unfair to leave them alone for hours at a time, every day. It’s about understanding that no dog is happy about this, no matter how much people believe they sleep all day and are fine. It’s also about realising the severe anxiety that some dogs suffer as a result of being alone, making them aware that it’s happening, and what they can do to help their dogs cope. Do you happen to know if there are different breeds of dogs that seem to have more separation anxiety. My neighbor has a chihuahua that barks all day long. I always know when my neighbor just walked in the door because the dog instantly stops barking. I could see aromatherapy could possibly work for the dog; it has worked for me, and it’s one thing that really helps my mood. Hi Garen, good question. It’s really not about the breed as much as the fact that dogs are left alone for too long. Of course people have to leave the house and go to work, but many dogs suffer terribly as a result. 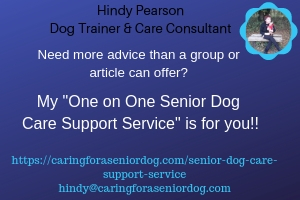 There are lots of helpful tips in this post that your neighbour could try, and it goes without saying that having a neighbour, friend or dog walker take the dog out or keep him company will help. This is a link to a review I did about an amazing product that works very well. It’s not a guaranteed help for every dog, but it is for many. http://caringforaseniordog.com/through-a-dogs-ear-music-to-calm-your-canine-companion-review Like I said earlier, have your neighbour read this article for advice, and if he would like to contact me, I would be more than happy to help. Garen that would be so kind of you to help. The poor dog is so stressed, it’s not his fault. Let me know how things go. Oh wow, now you got me feeling a bit guilty of causing my dog anxiety. Well you said to not pay attention to her when I leave and when I get back.. well I do the opposite. I can try to do that for sure though, that seems easy enough. My dog knows when I am about to leave too, she see’s me with my backpack on and gets all weird and goes into this ears down eyes up thing. I can try putting my backpack on and walking around without leaving to shake up the routine. These were some real good pointers. Is frisbee a good mental and physical activity for my dog? She’s a black Lab about 1.5 years old. We started practicing since she was 8 months haha. shes good! Hi Billy, ha ha!! Most people do the opposite too, don’t worry you’re not alone. Frisbee is great, so are long walks/hikes, dog parks, running off a leash (if you’ve trained her and she has good recall), agility, fetch, playing with other dogs, going to new places, ,.. and don’t forget interactive toys, games, hide and seek… If she is alone all day, perhaps a neighbour, friend, family member or dog walker can take her out in the middle of the day. Good luck, let me know how you get on, and if you have any questions, contact me anytime. Hi Brian, it’s nice to hear you’re getting some helpful information from my site. I post new content every Wed and Sat so check back for more. If there is anything I can do to help, or you have any questions, please don’t hesitate to contact me and I’ll be happy to do what I can. I loved your article. It was so comprehensive as far as looking into the medical issues that could be causing the negative behavior in a pet. Separation anxiety in older dogs can be just as prominent as in humans, and for many of the same reasons. I think that animal husbandry is just now starting to recognize that pets can have problems just like humans. I remember when I was young we had a poodle. He was great and was a big part of, and interacted with each member of our family. If the house was empty (ie. we all we shopping or had independent things to do) Jack would go around to everyone;s bedroom and pull things from the laundry that had our most distinct smells. (of course they would be our socks and underwear – YUK!) But he never chewed them. He would just make a pile of them and then lay on them until we got home. We were fortunate that he found a positive way to self sooth the separation anxiety he was feeling. Well at least he wasn’t destructive. I have heard of some animals actually chewing on parts of their bodies in a nervous anxiety frenzie. So I am really glad that your article makes a point of this rather common occurrence of separation anxiety. Thanks Debra, I’m so happy to hear that. I love your story about Jack, hilarious, but it also goes to show how clever they really are. We have a Jack as well, and he too has a thing for underwear from the laundry bag. It is a relief for you, I’m sure, to know he handled his family being out in a positive way. Sadly many dogs just freak out – they chew up the furniture, break through doors, chew their fur and just bark uncontrollably. Unfortunately most people would never believe this happens, and insist their dogs are fine. I only hope this article will help.